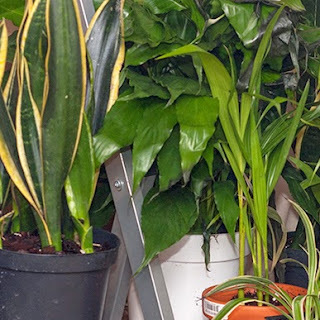 House plants can help purify the air by removing toxic chemicals as well as kill mold spores and bacteria in the air by producing negative ions. Here's a look at the most cost effective plants from the NASA Clean Air Study. I recently ordered about a dozen houseplants online in a mix of sizes from 2" to 6" pots. After I received them I set them all up in a warm room where they got a lot of indirect light so they could recover from shipping. After a couple of hours I entered the room again and I could instantly smell the effect of the negative ions produced by the plants. It was the same clean smelling air that I get if I have the ionizer on one of my HEPA purifiers on and plants save money on electricity and filter costs. You'll need to periodically wipe dust off the leaves or bring them to a shower for a good rinse. There are a lot of web pages published with information regarding the plants in the study on the big content mills. As is quite often the case with some of these sites that hire writers that may or may not have a good understanding of the subject there are some misunderstandings or misrepresentations on what the study actually says which is why I wanted to write this article. In addition I wanted to take a different look at which plants are the most cost effective at removing toxins. That's right all plants will improve your indoor air quality by removing toxins. At least that's the basic assumption. It's not just the dozen or so plants identified in the NASA Clean Air Study or other research. And it's not just the plants. A good portion of that air purifying power comes from the microorganisms that colonize in the soil around the roots! So why did the NASA study only list 12 plants? To answer that you first have to understand that NASA was looking into options for cleaning the air in sealed space habitats that may house astronauts for long missions. It doesn't look like they tested thousands, hundreds or even dozens of plants looking for which plants remove the most toxins. Instead it appears that they selected primarily a number of low-maintenance plants with low light needs and ran tests to see how well they performed against three common toxins found in building materials. These types of low-light, low-maintenance plants are not just great for space pods but work well as plants for homes and offices. If you have specific concerns about toxins in your home or office you should have the air assessed and get the appropriate types and quantity of plants that have been shown to remove those toxins. After you've had the plants in your environment you should follow up with another test to see how well the plants are performing. In general though 1 to 2 plants per 100 square feet is a good guide with more plants in rooms you're in most often. The NASA study indicates the how well a single plant removed specific toxins. The three they tested for were Benzene, Trichloroethylene and Formaldehyde. Each plant was set up in a sealed container with a fan to circulate the air and a known quantity of toxin was introduced into the chamber. Readings of the level of toxins in the chamber where measured before and after a 24 hour period to see how much toxins the plants removed. By looking at the data from the NASA Clean Air Study I was able to calculate how efficient each plant was at removing that toxin in terms of micrograms of toxin removed per plant leaf area. Another calculation was to determine how many plants would be required to remove 25,000 micrograms of that toxin based on the recorded results. Comparing that value with the current market price of the plant we can see which plants will give you the best bang for the buck. The NASA study didn't include container size for each plant so I'm just assuming common pot sizes for the given plants as would be sold by most nurseries. For that reason, and because not all plants are identical, these numbers should just be used as a rough guide. The highest concentration of toxin in your home or office air is likely formaldehyde. It's in a lot of building materials, furniture, paper products, cosmetics, deodorants, shampoos, cleaning products, released by burning gas, kerosene or smoking cigarettes and it's even in new clothes. If you bought Chinese manufactured laminate flooring from Lumber Liquidators it's apparently a big problem according to a recent 60 minutes report. The following table lists the plants from the study. Notice how the amount of toxins removed (in micrograms) per leaf surface area varies widely indicating some plants are much more efficient than others at removing formaldehyde. That alone isn't a good indicator of how cost effective the plant will be since the size of a plant varies by type. By looking at how many plants are required to remove 25k micrograms of formaldehyde and comparing that to the cost of plants we can see that the Bamboo Palm is going to give you the most formaldehyde removal for your money. Even though the Banana plant has a very high µg/area it is not very cost effective because each plant doesn't have a lot of leaf area. But it's the only plant on the list that produces an edible fruit. For some reason Goldon Pothos gets brought up a lot, even by the primary researcher Dr. Wolverton, but there isn't much data on it in the report and what is there regarding formaldehyde doesn't look that impressive to me. This nasty volatile organic compound comes from a variety of different sources. One of the biggest sources is cigarette smoke but it's also found in paints, adhesives, paint removers and is emitted from car exaust as well as burning other fuels. The clear winner here is the Gerbera Daisy. The plants are relatively small yet remove a large amount of benzene. The downside of the Gerbera Daisy is that it requires more care and light than the other plants on the list. The peace lily does quite well at removing benzine for the price and is one of my favorite house plants. I spent a couple of months away from home, only visiting every few weeks and a peace lily I had in a corner away from any light was still alive in spite of the neglect. A little water and it recovered quickly. 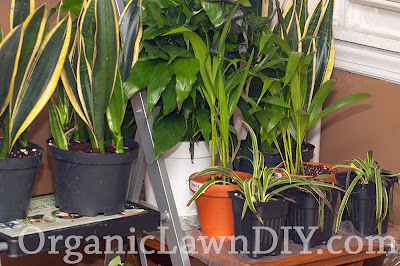 Snake plants are also very easy to care for and don't take up much space for the amount of air purifying they do. They're great for bedrooms since unlike other plants it converts carbon dioxide into oxygen at night instead of during the day. Sources of trichloroethylene are glues, adhesives, paint removers, spot removers, rug cleaning fluids, paints, metal cleaners and typewriter correction fluid. It can even enter your home through water. Again the Gerbera Daisy is the winner again in terms of effectiveness and cost. They're also very popular for their beautiful blooms. Thank a lot! It helped in my plant selection.